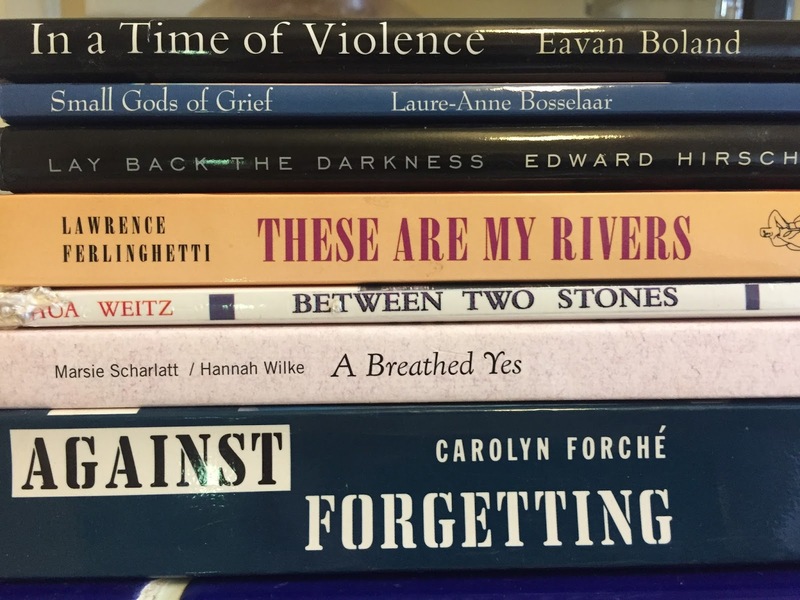 Congratulations to Dinah Berland for submitting the winning Book Spine Poem, shown above. The poem is well-constructed and very timely. Dinah blames her puppy (who also likes book spines) for obfuscating the first name of the author of Between Two Stones, Joshua Weitz. But of course, the author's names are not part of the poem. Congratulations, also, to Carole Mertz, author of the winning Book Title Poem. Read the poem once just as a poem. Read it again to see how many book titles you can pick out (she used fourteen). Then scroll down to check the list, which appears at the end of this blog post. the sleeper and the spindle. Winning poets retain copyright to their poems. Please do not copy them without permission. Thank you to Kathy Lohrum Cotton for judging the August Poetry Challenge. 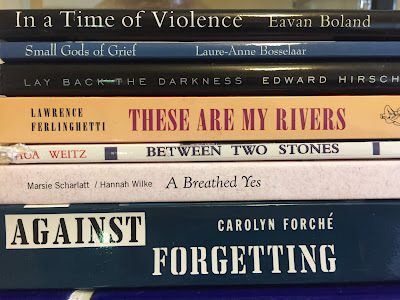 Dinah Berland’s poems have appeared in The Antioch Review, The Iowa Review, Margie, New Letters, One, Ploughshares, and Third Coast, among other journals, and are anthologized in Verse and Universe: Poems about Science and Mathematics and So Luminous the Wildflowers: An Anthology of California Poets. She received her MFA in creative writing at Warren Wilson College, was formerly senior editor at the J. Paul Getty Museum, and recently served as Writer in Residence at the Annenberg Community Beach House in Santa Monica, California. Carole Mertz writes self-prompted poems but also enjoys unusual external prompts. She reads Tyler’s novels and did a writer’s course this summer based on Jamison’s The Empathy Exams. McCall Smith is an old favorite, though she’s heard The Really Terrible Orchestra only once. Mertz’s recent poems are in Voices de la Luna, The Write Place at the Write Time, and Voices on the Wind. Anne Tyler’s A Spool of Blue Thread, The Amateur Marriage, Dinner at the Homesick Restaurant, Digging to America, Breathing Lessons, Saint Maybe, The Beginner’s Goodbye, Searching for Caleb, and A Patchwork Planet.